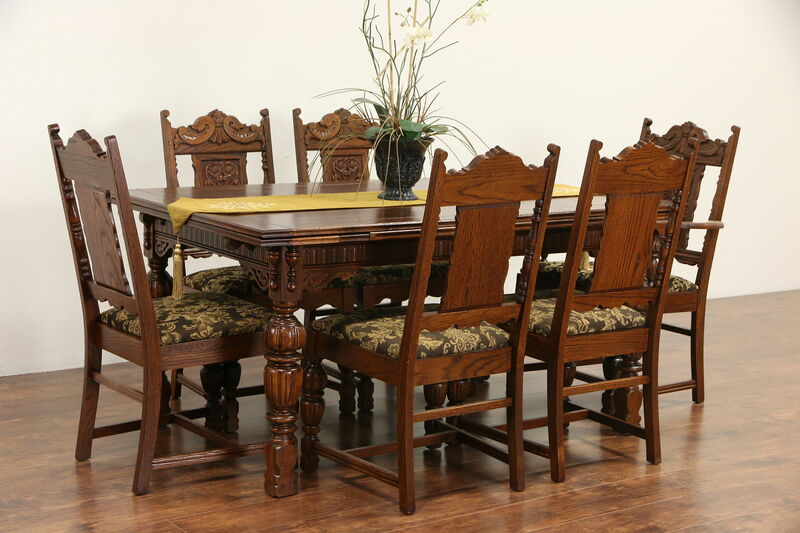 A classic English Tudor design dining set from about 1920 is boldly carved. The finish is in excellent condition, enhancing the quarter sawn oak grain. American made antique furniture, the table and chairs are strong and tight, reglued to served another generation. At both ends of the table, there are pull out or draw leaves. Measurements are 40" wide, 31" tall, legroom is 26" underneath and length when closed is 64," with both leaves extended, length is 92" overall. Chairs are newly upholstered. The arm chair measures 26" wide, 24" deep, 41" tall and the seat is 19" high, five side chairs are 21" wide and 23" deep. The matching sideboard is priced and sold separately, call or email for availability.